Mayhems Final Notice 2016 Registered Bay Roan Half- Arabian filly sired by My Final Notice (AQHA) and out of AL-Marah Fair Faith (Opalo x AM Light Headed). 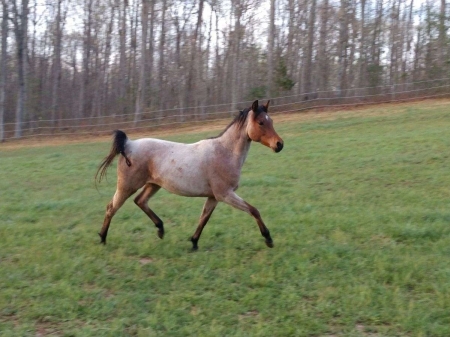 Rosie is a very sweet filly that has an in your face personality and willingness to please. She gets along great with everyone, hauls with no issues. She was hauled to her first open show last year and handled it like a pro! She showed in both Sport Horse in Hand and Open Trail in hand, she took 1st in Sport Horse, and 4th in Trail in Hand in a class of over 14! This filly would make a phenomenal show filly! This filly leads, loads, ties, cross-ties, bathes, stands for farrier, clips, and is current on all shots, worming, and dental.